Decolonizing Anthropology is a new series on Savage Minds edited by Carole McGranahan and Uzma Z. Rizvi. Welcome. These questions continue to haunt anthropology and all those striving to bring some resolution to these issues. It has become increasingly important to also recognize the ways in which those questions have changed, and how the separation between Western and NonWestern is less about locality and geography, but rather an epistemic question related to the colonial histories of anthropology. 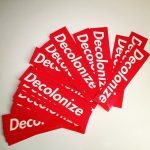 Decolonization then has multiple facets to its approach: it is philosophical, methodological, and praxis-oriented, particularly within the fields of anthropology. Here at Savage Minds, we have decided to take these questions on again in a different public, and work through a series of dialogues, debates and possibly even reconciliation. We feel it imperative to decolonize anthropology; not doing so reiterates hierarchies of control and oppressive systems of knowledge production. But what does that really mean and what does it look like? What might it mean to decolonize anthropology? Various subfields of anthropology have been contending with this issue in different ways. For example, within archaeological literature, decolonization emerged as political necessity developed through an engagement with the postcolonial critique. Being inspired by Linda Tuhiwai Smith’s influential work on decolonizing methodologies (among others) resulted in the development of indigenous archaeology. Most archaeologists would argue that anthropological archaeology continues to exist within neocolonial, neoliberal, and late capitalist frameworks, and thus these critiques and methodologies need to be constantly revised utilizing interdisciplinary projects that locate decolonization across academia (including decolonizing epistemologies, aesthetics, pedagogy, etc). Calls for decolonization have now emerged as mainstream politics in the academy: an era when academics across disciplines are calling for historical, financial, and intellectual accountability for not only the work we do, but also for the academic institutions in which we study, teach, and learn. We contend, therefore, that decolonizing anthropology (at a minimum) has now grown to a project beyond its initial impetus in treating non-anthropologist intellectuals as just that: intellectuals rather than local interlocutors. In its development across the discipline, in both archaeology and cultural anthropology, for example, decolonizing anthropology is a project about rethinking epistemology, methodology, community, and political commitments. Epistemology. Decolonizing anthropology means rethinking epistemology. Anthropologists have long acknowledged the development of our field with a colonial impulse, and how the construction of knowledge reiterate systems of control. It is important to continue working through epistemic concerns to realign how our discipline might undiscipline itself and realign how it evaluates what research is considered important. Decolonizing epistemology destabilizes the canon. It is not enough to only add certain voices into our anthro-core classes; a decolonizing movement focused on epistemology provides rigor to the multiplicity and plurality of voices. Deeply linked to the ways in which knowledge is produced and constructed, is our pedagogy and the methodologies by which we practice. Pedagogy. If we are to realign our discipline, it becomes imperative for us to reconsider how decolonization might impact our pedagogy. This is not a new concept in the academy: decolonizing pedagogy is a subfield within the field of education. As mediators/translators/facilitators of knowledge, it is our responsibility to consider how anthropological conversations about race and difference might be supported and developed in the classroom through a decolonized pedagogical practices. A decolonized pedagogy should be listed within as best practices in our guides to teaching and learning. Pedagogy also includes what one teaches as well as how. What forms the anthropological “canon” of works that one must know? Part of the decolonizing of the discipline is to reassess whose scholarship we mark as important via inclusion on course syllabi. The rediscovery of Zora Neale Hurston’s scholarship by anthropologists is the most obvious example; who else are we–or should we–be learning from and thinking with anew today? Methodology. Decolonizing anthropology means rethinking methodology, Our history is full of taking information from communities without enough consideration of the impact of this form of anthropological research. This does not only mean filling out our IRB forms, but also thinking carefully about power. Institutionally, our bodies are disciplined to hold and claim certain statuses as anthropologists. How does tending to such manifestations of power redirect our relationships in the field, our research questions, the ways we teach, and the way we work with communities? Community. Decolonizing anthropology means rethinking community. Rethinking who the communities are within which we do our research. Rethinking the way we stretch and build our community of conversation to open beyond the academy, and learning how to extend our deep anthropological practice of listening with our ears and with our hands, and cultivating a spirit of reciprocity for a new era. 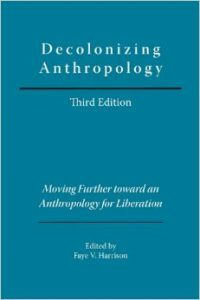 And at the heart of today’s decolonial project, rethinking who our community of anthropologists is, and rethinking strategies of recruitment and retention for an anthropology that reflects and includes the communities whose stories, beliefs, and practices have long been those which comprised our discipline. Political Commitment. Decolonizing anthropology means rethinking our political commitments. It also means to acknowledge that we are not the first to have them. Anthropology has long been a discipline with a political edge to its scholarship for some of its practitioners. However, as decades turn into centuries, what was once politically edgy looks embarrassingly not so, conventional or racist or both. We believe that a decolonized anthropology involves research that advances our understanding of the human world in a way that moves us forward. All of this involves communication. As editors, our goals for this series are both personal and professional. Our first collaboration was an India Review special issue on Public Anthropology (2006), edited by Carole McGranahan, with Uzma Z. Rizvi as a contributor to the issue. Carole recently revisited her introduction to that volume in a keynote lecture for the annual American University’s Public Anthropology conference in 2014. In a talk on “Tibet, Ferguson, Gaza: On Political Crisis and Anthropological Responsibility,” she reflected on political changes in the discipline over the last decade, including our need to not only address anthropology’s colonial past, but also our imperial present. This is the sort of thinking we began together in 2006. Uzma’s article entitled “Accounting for Multiple Desires: Decolonizing Methodologies, Archaeology and the Public Interest” was based on her PhD research (2000-2003) in Rajasthan, India. The project was designed as a community based-participatory action research project that was explicitly linked to decolonizing archaeology in India. Both of us have had a long standing engagement with this literature and consider this contemporary moment to be significant within the praxis of our discipline, which is why we are thrilled to launch this series! We have invited anthropologists writing and thinking about decolonizing the discipline to contribute essays to this series. Essays will be posted roughly every two weeks, and if any readers would like to submit an essay for consideration, please send us an email at decolonizinganthropology[at]gmail.com.